A PLAQUE marking the burial of King Henry I, youngest son of William the Conqueror, in the Abbey Ruins, has been recreated in anticipation of the site’s opening on 16th June. The plaque celebrates the important fact that the abbey, founded by Henry in 1121, was the final resting place of the king and his Queen Adeliza. It has the decoration of a bronze crown set into the stone above the text. It was first installed on 18th June 1921 as part of the 800th anniversary of the foundation of Reading Abbey by Henry I in 1121. It is located on a wall of what was the part of the abbey church (now the wall of the Forbury Day Nursery) facing the ruins of the south transept. The original plaque was in a very poor condition, with the stone and lead lettering beyond repair due to serious water erosion of the entire surface. The plaque has now been expertly recreated by conservation specialists Cliveden Conservation. Despite the severe erosion on the original, they managed to retain the original bronze crown which has been reinstated as it was on the original plaque. As part of the restoration work, a protective stone shelf has been installed over the plaque to prevent future water damage. The ‘Reading Abbey Revealed’ celebration will take place from 11am on Saturday 16th June 2018, following a three year £3.15 million conservation project. The re-opening festival coincides with Water Fest, Reading’s annual celebration of the town’s waterways. There will be a host of exciting activities and performances throughout the day, including the chance to meet King Henry I and other historical characters from the Abbey Quarter. Cllr Tony Page, Reading’s Lead Member for Strategic Environment, Transport and Planning, said: “The team at Cliveden Conservation have done an excellent job of recreating this important plaque. As a town, I think we should be extremely proud that Reading was the final resting place of Henry I, the son of William the Conqueror. Historically, the Abbey was one of the most important religious buildings in Europe, often visited by pilgrims and nobility from throughout England before its dissolution in the 16th Century. Since the abbey’s closure this site has faced much disruption from being blown up during the English Civil War to Victorian looting. 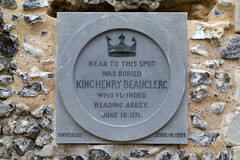 As a result, it is a mystery whether Henry is still buried here in Reading. The ruins closed in 2009 as they were no longer safe to be open to the public. After 9 years and thanks to £1.77 million funding support from to National Lottery players and the Heritage Lottery Fund and match funding of £1.38million from the Council, the ambitious project to reinvigorate Reading’s pre-eminent and nationally important heritage site will be complete. Reading Abbey Revealed is a major project, made possible through £1.77 million funding support thanks to National Lottery players and the Heritage Lottery Fund and match funding of £1.38million from Reading Borough Council. Thanks to National Lottery players, we invest money to help people across the UK explore, enjoy and protect the heritage they care about – from the archaeology under our feet to the historic parks and buildings we love, from precious memories and collections to rare wildlife. www.hlf.org.uk Follow them on Twitter, Facebook and Instagram #HLFsupported.